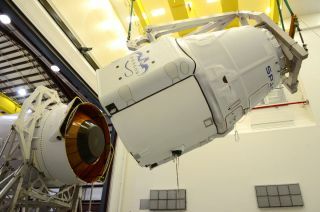 A SpaceX robotic Dragon space capsule is mated to the top of its Falcon 9 rocket ahead of a planned March 2014 launch to the International Space Station from Cape Canaveral Air Force Station, Florida. Image released March 11. When private spaceflight company SpaceX launches its newest mission to the International Space Station next week it will carry some strange cargo to space. SpaceX's unmanned Dragon capsule is scheduled to launch from Cape Canaveral Air Force Station in Florida atop the company's Falcon 9 rocket on Monday (April 14) on its third official resupply trip to the space station. Liftoff is set for 4:58 p.m. EDT (2058 GMT). Among the 5,000 lbs. (2,268 kilograms) of cargo riding aboard Dragon are a set of legs for a robotic astronaut, an experimental mini-farm for space vegetables and a wealth of other odd items. NASA's humanoid robot Robonaut 2 — designed to eventually help astronauts with menial tasks in space — is getting space legs for the first time. The long lower limbs are flying to the station with SpaceX, and they will be attached and initially tested in June. Once attached, Robonaut 2's leg span will reach about 9 feet (2.7 meters), and each leg has seven joints. The legs should allow for enough flexibility to let Robonaut 2 work outside and inside the International Space Station, however, the robot's torso will need some upgrades before it can venture outside of the station, NASA officials have said. The space station is about to get a new laser communications experiment. Called OPALS, NASA's Optical Payload for Lasercomm Science, the new laser will help scientists test ways of transferring information more quickly than traditional radio transmission. The new form of communication could aid in future missions to more distant deep-space destinations. Many existing deep-space missions send 200 to 400 kilobits of data per second, however, OPALS will up that data rate to a speed of up to 50 megabits per second. Future optical communication designs could reach rates of a gigabit per second. Science Cheerleader — a group of science-minded current and former NFL and NBA cheerleaders — helped craft an experiment that will take 48 microbe samples swabbed from historical places into space. Called Project MERCCURI (short for Microbial Ecology Research Combining Citizen and University Researchers), the experiment is designed to help collect more data on how microbes behave in microgravity. Science Cheerleader partnered with SciStarter.com and the University of California, Davis, for the project. The 48 samples were picked by a team led by professor Jonathan Eisen at UC Davis. The cheerleaders and other members of the public collected 4,000 possible samples for the flight. One of the swabs chosen to fly is from John Glenn's 1962 Mercury capsule, Friendship 7. NASA is sending its next cubesat built from a smartphone up to the space station on Dragon next week. Called PhoneSat 2.5, the new, tiny satellite is the fifth in a series of smartphone-based satellites launched to space. The space agency is developing these small satellites to see how well relatively cheap electronics can perform in the vacuum of space. That doesn't necessarily mean that the PhoneSat can make calls. "If I showed PhoneSat to you, you'd ask, 'Where's the phone?" Bruce Yost, program manager for NASA's Small Spacecraft Technology program, said in a statement last month. "That's because, although we buy the smartphone off the shelf, much like the one in your pocket or purse, we take it apart and repackage it to fit in the cubesat form and work in space." A prototype version of Veggie with red romaine lettuce plants growing inside of it. It's time to grow more food in space. A new plant growth experiment called Veg-01 will use a miniature space farm called "Veggie." It is launching to the station so astronauts can start growing "Outredgeous" lettuce seedlings on the orbiting outpost. "Veggie will provide a new resource for U.S. astronauts and researchers as we begin to develop the capabilities of growing fresh produce and other large plants on the space station," Gioia Massa, NASA payload scientist for Veggie, said in a statement. "Determining food safety is one of our primary goals for this validation test." With NASA officials hoping to mount a crewed mission to Mars or other deep-space destinations sometime in the future, it is important to learn more about safely growing food in space, space agency officials have said.